ForeUI V1.40 is available now! This update is the one we scheduled for a long time. The key enhancement is to give Mac users a better experience. Now we have made the enhancement, you can download the “ForeUI.dmg” disk image file. Double clicking the file in Mac OS will mount the disk and you can find the “EaSynth ForeUI” application inside, you can copy it to any place you want, or drag it to the dock for future usage. Use BackSpace key to delete element in plot. If run older version under JRE5, ForeUI can not popup web browser window when it need to visit a URL. Now it is improved and ForeUI always able to access web browser. Auto unify the format of boolean value in expression. When editing expression for condition checking, we may need to use boolean value for comparation. Actually one the lower-case true/false values are acceptable, in order to avoid the confusion, the expression editor will auto-correct the boolean value to lower-case form. ForeUI V1.37 is just released! The most interesting update is the “Display Control” new feature, you can see a new button on the top-right corner with text “Display(?/? )”, you can click it to see how it works. It can exclude some elements for editing, so that you can easily work on the elements overlapped by others. This feature can partly solve the problem mentioned in the “Easy element select / hide-show elements” topic. Menu Bar/Tabs/Table can escape the comma in content. It is discussed in the “Commas as delimiter for table columns causes problems” topic, thanks Ari and John for the suggestions! UI theme switching can take effect without pressing “Apply” button. Bug_0073: Copy/Paste element does not update its behavior correctly. This bug is similar with the one on page copying (Bug_0068, fixed in V1.35), but it is for element copying instead. 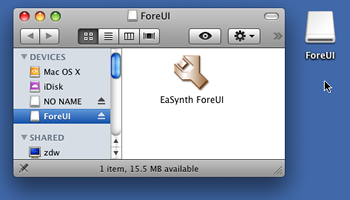 Hi everyone, I am proud to announce that ForeUI V1.35 is released today! This new feature is requested by Erik, he also gave us some useful suggestions, thank you Erik! This new event is really useful, it will be triggered when selection within the element is changed, with it we can implement multiple actions for one element, according to its selected item. This enhancement is really big and exciting. Now these elements are not only images durring the simulation, they are interactive and you can operate on them! 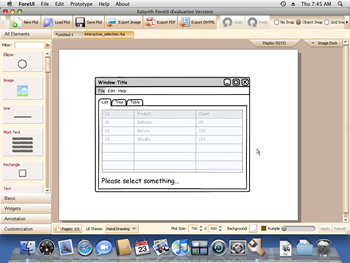 The plot file for this demo is also included in the install package, you can open the “interactive_selection.4ui” plot in ForeUI and see what’s inside. Reported by Cristian Prundeanu, thank you Cristian Prundeanu! [Bug_0072] Hand drawing theme: Image elements are always grayscale. Reported by Jeremy, thanks for the reporting! We’ve just released the V1.32 of ForeUI, which include some bug fixings, enhancement and customized element. Fixed Bug_0065: Transparent GIF image are not painted collectly. Fixed Bug_0066: The spaces at the beginning are not renderred on the plot. Fixed Bug_0070: Image Export: choose existed file and change the name doesn’t make sense. I’ve just post a new article about the “Fidelity Independent Wireframe”. It seems I’ve made a new word :-), anyway, I got the inspiration from the word “Platform Independent”. With ForeUI, we don’t have to create them one by one, just create one prototype and then switch the UI theme to export different figures. It is a significant time saving. You can find more details about the prototype fidelity in the article.